Mokume Gane is a Japanese metallurgical technique for creating a decorative pattern-welded material from precious or semi-precious metals. I made some. Generally, it’s made by putting copper and nickel, or gold and silver, in a press then heating the press to forging temperature. 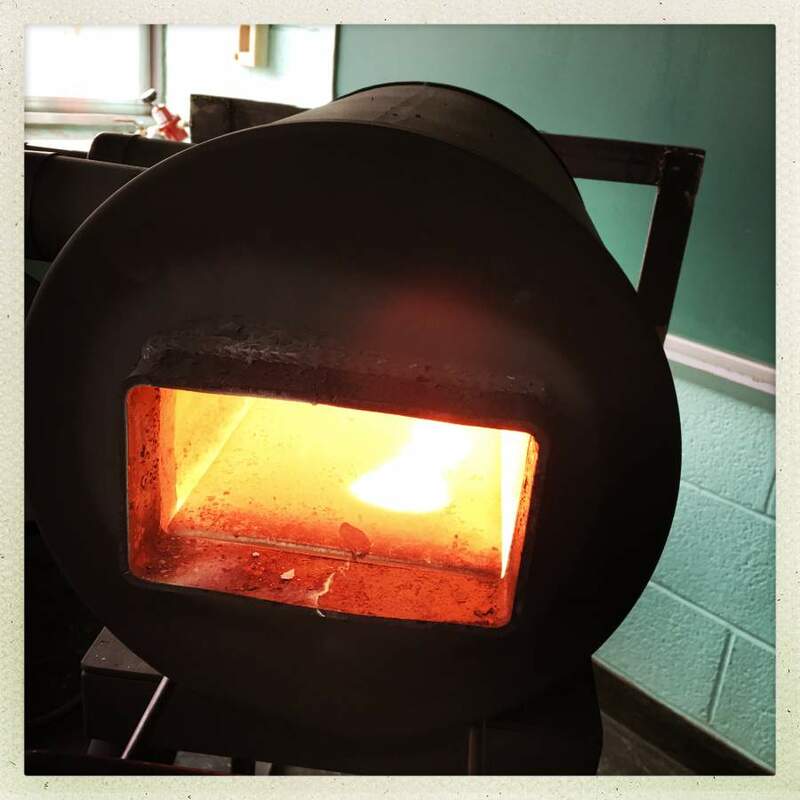 Forging temperature for copper is around 1500F, not 2300F like it is for high carbon steel. Pieces of metal, ready to stack. I just took a piece of mild steel and chopped it and drilled it; that’s my clamp. I packaged the metal in stainless steel foil; I thought that would make it less prone to oxidize. Well, sort of. As it happened, the stainless foil resulted in a whole lot more oxidation than I expected. I started bringing the heat up and around when the packet of metal was reading 1500F the interior of the forge looked like it was closer to welding temperature for steel. 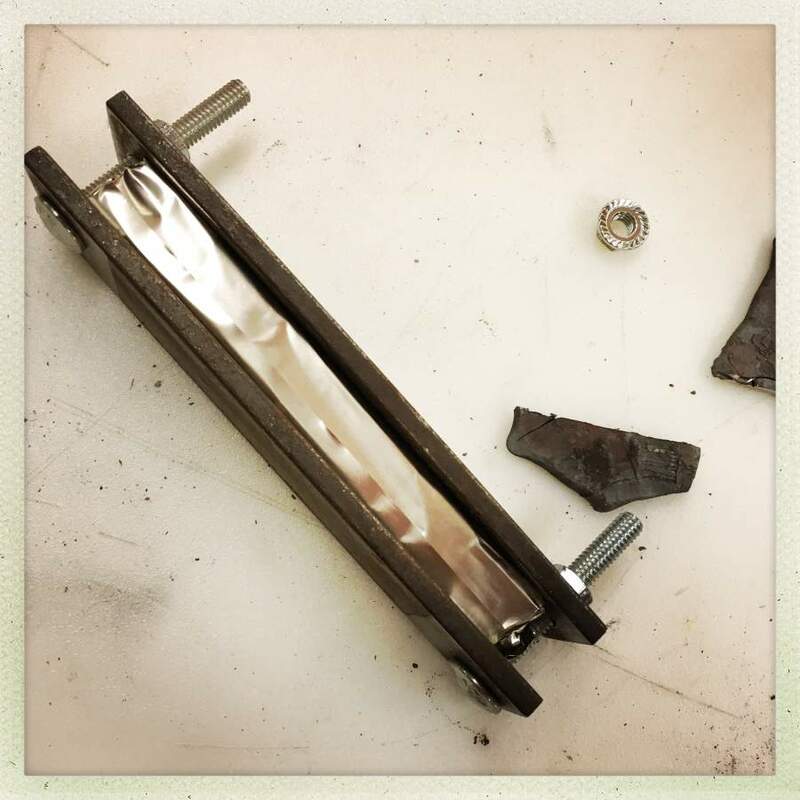 I gingerly grabbed the packet and started to pull it back – then the stainless foil tore and a stream of molten copper/nickel blobbed into the inside of the forge. The rest cascaded onto the floor, splashed in all directions, and instantly I had about 20 small fires. I have gratitude for Melvin Davis, my high school and college karate sensei, who taught us that being able to move backwards fast was as important as being able to move forward fast. Before the stream of molten stuff had hit the floor I was halfway across the room going backward. I got to see all the pretty sparks and fires, though. It was interesting – the gobbets of metal made the floor burst into flame where they hit, but they spontaneously went out when the metal dropped below kindling temperature. Basically, it was as if I had poured a half a cup of molten solder on the floor. The whole game here is thermal mass, not peak temperature. There’s a small splash-guard I built around the forge against exactly this sort of eventuality, and it worked perfectly. It’s just a 2″ high paved area of fire-bricks between the forge and the anvil. Turned out that was a really good idea. Turned out that the stainless foil was not a really good idea, because it made it impossible for me to determine the state of the metal before I tried to grab it. Look at the way the blobs of molten stuff cooked lines in the floor as they hit. If it had splashed on my shoes I probably would have caught fire and that would have been the end of me. In case any of you think I am arrogant (there have been accusations, but none voiced recently) let me assure you how humble-making and thought-provoking this sort of experience can be. It’d probably make me pray with deep sincerity, too, if I thought that stuff worked in the least bit. Actually, I have a confession to make: following cartomancer’s suggestion I have occasionally offered a libation to Agni, and Haphestus; I keep a bottle of very nice Solera in the cabinet. I sprinkle a few drops around for the gods every now and then and usually finish the thimble-sized cup off when I shut down for the day. So, perhaps Melvin Davis was (once again) my guardian angel of retrograde velocity and Agni lifted me to safety, or something – I really don’t care, as long as I didn’t get a molten copper pedicure. When the press cooled down, I was able to dissect the stainless foil pack and there was still about half of the ingot in there. I heated it to working temperature and beat on it a bit to get some different textures in the metal, but my heart just was not in the idea of trying to bring it to welding temperature and attempting a fold. 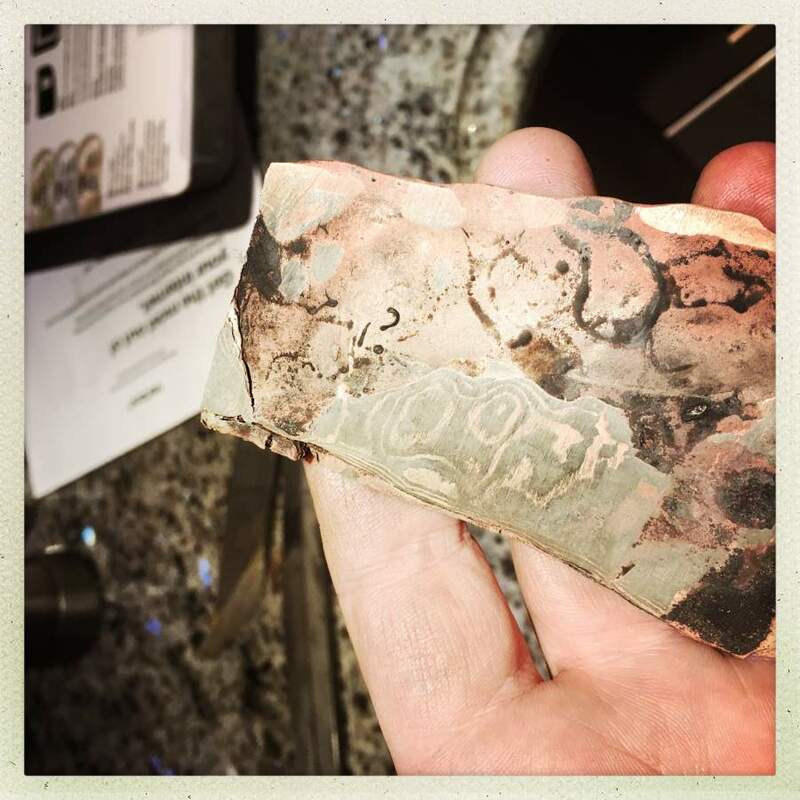 I don’t think I am going to do much with mokume gane in the future, and if I do, I am going to do it by making a small enclosure of fire brick, then bringing the stack up to temperature using an oxy/acetylene torch. That will give me much more positive control over the temperature and I’ll set the whole process on a steel plate on some insulating wood right on the floor so that I’m not risking anything falling any distance. I’m going to give some thought to making a 3″ deep cat litter pit around the forge, in case anything falls I want cat litter there to smother it and reduce the chance of it bouncing. I may use welded steel for the litter-box walls, so I don’t have to worry about the alternative – wood – catching fire. This is a learning process so I expect “hiccups” – I’m just trying to make them non-lethal hiccups. My self-confidence is at a low point, I confess. I had a nightmare a couple nights ago, in which I had a forge accident. In my dream, the forge stand’s leg melted off, and the forge fell sideways. Onto its propane feed line. The cut-off is on the other side of the forge and in my dream I had to jump over the fire-spewing hose and go for the cut-off. I woke up in a flop-sweat, freezing cold – but the freezing part was because someone had rolled away with most of the blankets. Anyway, this made me sit wide awake for about 3 hours thinking “how could I have been so stupid, not to think of that before?” and redesigning the feed system around braided stainless hoses, re-positioned ball valves, and quick disconnect connectors (which cut off gas if you pop them) Today I audited the position of everything, measured, made an inventory for the steel hoses, and it’s actually not as bad as it was in my dream, but I’m still going to re-do the whole layout; I may not run the forge until I get that sorted. If you look in over the left shoulder of the forge in the picture of the molten copper puddle, you can see the cutoff valve and the regulator. Those should be someplace easier to reach. By the way, there’s a really clever trick that Neils came up with (lifted from the vikings?) of putting glass in the crucible along with the steel. When the steel reaches melting temperature the glass is already liquid and floats to the top quickly, acting as a barrier to prevent the steel from oxidizing. It’s also pretty cool that the steel’s shrinking as it cools pulls it away from the crucible; it just pops right out, thump, on the floor. Someone you trust has your dental records and a DNA sample, right? Fun story: in high school, my chemistry teacher demonstrated the thermite reaction in a small crucible. Unfortunately, he forgot to put the crucible on a non-flammable heat-proof mat… The crucible conducted enough heat from the thermite to set his desk on fire. If anything goes that wrong, I’ll be past caring. My executor (my accountant) has all the proper direction and will sort out the process of neatly shutting down my life and turning off the lights. Sand. Wood stops being insulating right around the time it catches fire. I have several big garbage cans of cat litter standing by in case they come in handy. It’s wonderfully insulating. The crucible conducted enough heat from the thermite to set his desk on fire. My high school science teacher demonstrated oxygen/hydrogen using a small steel bottle with a cork and an electrical igniter. The cork went right through the tile ceiling and whapped around in there quite amusingly. I am quite sure it did a lot for our love of science. I was disappointed by thermite. And I’m outright miffed by how often it’s mis-represented in movies. Besides, anyone using thermite to blow locks is an idiot who has never seen an oxy/acetylene torch or an angle grinder. I made a portable thermic lance, once… um, never mind. I admire enormously the men who worked in the iron and steel industries and moved hot metal around. The huge crucibles hung from overhead tracks are impressive, but it is the men moving a far smaller, but not small, crucibles with a pair of feet long tongs that impress me the most, the strength and control necessary is amazing. Though there is a reason why the Sheffield hospitals have their own prosthetic makers. So don’t just keep yourself alive Marcus, keep yourself intact too. The resulting lump of metal looks very pretty, I would love to see it polished to a shine! Lucky you were not harmed! Maybe you should invest in another thermometer, perhaps. Looking at phase diagrams of Cu/Ni alloys, at 1500F (815°C?) there should be no melting. I Agree with Dunc, sand should be the safest! Cat litter can contain organics that will just start to burn (don’t phone order, inorganic and an organic sound way too similar D: ). In after school extra chemistry lessons we made alloys by aluminothermic reactions (in c.a. 10g batches if i recall correctly, not much anyway). One time we did not dry one of the educts enough* and as a result had a big flomp (steam) and liquid metal dropping from the celing. A very humbling experience (but also very pretty, when safe behind a safetyshield). Are you referring to the short-lived sport of dynamite ice fishing? You know, you drill a hole in the ice, put the dynamite through, detonate it, then collect the fish. Especially if you have a cat. It’s because “they” couldn’t have brought down the World Trade Centers with angle grinders, duh! Well, that was certainly a lot of excitement… glad to hear you did not end up with blobs of molten metal on you! YIKES! One of the jewelers I used to work for was exceptionally good at propelling her office chair (with nice rollers on the feet) backwards away from her torch when something went a little awry. 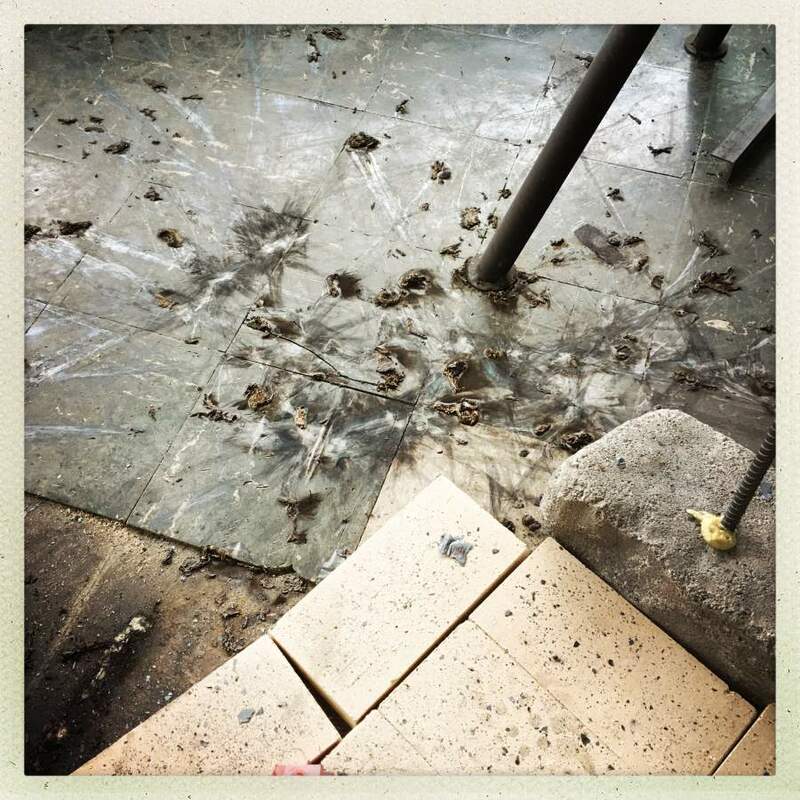 There were melt marks in the carpet sometimes as much as 4′ away from her bench, and yet somehow she would be able to propel herself away from that flying bit of molten metal so that it never landed on her. She worked with high-karat gold, so her temps were getting close to 1,900 F.
Your mokume-gane looks marvelous! If it were me I would have a hard time waiting for it to cool so I could polish it… I bet it will be really beautiful in whatever you make with it. As a demonstration, a jeweler once explained to me why one does not wish to do anything with “casting” platinum. He melted a drop with an oxy torch and carefully dropped it on the side of his bench. It went through the entire bench and out the bottom of the floor of his shop. Then, he told me to wait for it to cool and I could rummage around underneath and recover it – that stuff costs real money. 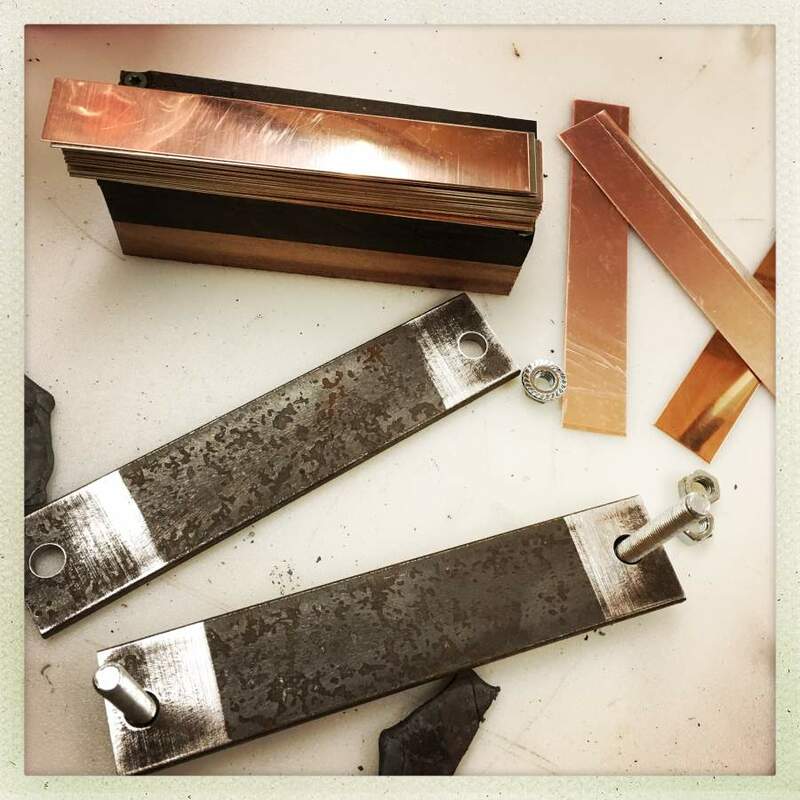 Ever since then I have maintained my focus on working with metal that is at least “mostly solid” which was why the unauthorized excursion of copper-nickel was so grievous. Thank you for your concern; I worry too and (contra appearances) am thinking constantly and hard about safety. One thing that occurs to me often is that we think nothing of playing bumper cars on the freeway, sharing it with semi-trailers carrying 50,000lb moving 75mph – that’s “just another drive to work” but working with hot steel is threatening. Well, working with hot steel is threatening but we’ve just gotten used to the semi-trailers. If I ever start to get the slightest feeling that I am as comfortable in my shop as I am on the highway, I will go back to photography as a hobby. This is a learning process so I expect “hiccups” – I’m just trying to make them non-lethal hiccups. My self-confidence is at a low point, I confess. I had a nightmare a couple nights ago, in which I had a forge accident. Speaking of creative nightmares, I have a recurring one. I see some amazingly pretty once-in-a-lifetime scene in front of my eyes—a beautiful landscape with some gorgeous clouds during the golden hour, a wild animal or a bird lit by the soft glow of the sunset, something like that. I have my camera with me. I try to take a photo, but the shutter button gets stuck (or something similarly weird happens with it). My camera breaks in some very weird way that couldn’t happen in real life. I frantically try to get my camera to work, and in the mean time the pretty scene goes away—the sun sets, the bird flies away, something changes about the scene, and it’s no longer worth photographing. Of course I have missed plenty of nice photography opportunities because of various reasons (the most common one: my camera was left at home). But in these nightmares the reasons for missing the shot are completely surreal. Oh, by the way, I found a great deal on nomex shirts and cargo pants on ebay. One thing I plan to do is stop wearing fuel. @Marcus, #12: Great idea! LOL! I admit I was thinking about the Partner’s wildland gear for going into a fire. Except when we haven’t. I cannot even get used to something as trivial as a hot pot in the kitchen. Several years ago my mother accidentally poured some boiling strawberry syrup on my right hand. She was making the syrup and she asked me to help her hold the bottles while she poured the hot syrup in them. My hand healed completely (by now I don’t even have any visible scars anymore), but ever since that accident I have been paranoid about injuring my right hand. Nowadays, whenever I do something even remotely risky, I always do it with my left hand. There’s a hot pot in the oven and I need to pick it up and move it? Not with my right hand. I cannot draw with my left hand, which is why the idea of injuring my right hand terrifies me so much. On the other hand, I feel perfectly comfortable handling hot stuff with my left hand, so, apparently, my fear is situational. Mokume Gane is beautiful stuff but tricky. I’m still a bit hit or miss with it but over time my success rate has improved. Some tips I use that has helped me, YMMV. Put your billet in before the forge is hot. Let the billet come up to temp “slowly” and once at temp, let it sit a bit (let it soak). When its at the correct temp it will begin to shimmer like its wet but not melting. Don’t use foil unless you have very precise control of your forge temp. You want to be able to watch the billet. See above. If you can (not familiar with your shop setup), after it has soaked for a bit, pull it out, put it in a vice and squeeze it as much as you can before you lose too much heat ( <1 minute or so). Be sure to tighten your clamp bolts as much as you can without threading or twisting them. Repeat a few times. The key is heat, pressure, and time. And practice. And lots of fails. Just keep trying and paying attention and your success rate will improve. Obligatory caution! Use a respirator when you file, sand, or grind this stuff. Breathing metal dust is bad. Very bad. @ Ieva: Ouch, that sounds awful. I have the same reflex when it comes to needeled syringes though. @ Marcus 12: Yes, nomex is a good consideration when around very hot metal. Another safety tip from chem-lab: Never wear any plastics near a potential firesource. When they burn they will melt and will fuse with your skin. At forge-temperatures that may work well through the Nomex-layer*. The “Fuel” aspect is secondary to that, labcoats are made from cotton which burns slowly and ideally remains as charred remains, shielding the squishy bits from the brunt of the heat. *A childhood friend had a nylon sock burn/melt under jeans when we made a campfire and they sat on an ember. For damn sure there is no way I am going to hit it with a hammer if there is any chance it’s near melting temperature. That’s a whole lotta “nope” right there. Vices have a virtue of their own, there: pressure that won’t cause anything to squirt. +1 on the sand; sand it will be. And I will try NOT to make any ad hoc glass. Vices also apply pressure more evenly and steadily. *not sure if you’ve tried that yet. Its quite enjoyable (to me anyway) and can be very pretty. I have either forgotten you were into smithing or you started after my recent (too long) hiatus from reading your blog. Sadly my smithing is going the other direction. Moved from a very friendly smithing environment to one not so much. Having to rebuild my shop altogetthor now with the new restrictions in mind and time has just not been on my side thus far. I’m hoping I can get back into it more this summer. Got a trip-hammer and move into a 2nd floor apartment? Ouch, that sounds awful. I have the same reflex when it comes to needeled syringes though. I’m perfectly fine with syringes. I don’t particularly worry about pain or injuries that will heal without any permanent scars. Which is why, back when that accident happened, the thing that bothered me most was being unable to hold a pencil for some days. Yep, bilingual problems can be so fun! This happens with me often, too. Generally, I don’t mix up words, but the languages I know influence each other more subtly. For example, in German there are the separable verbs (trennbare Verben, for example, abfahren becomes fährt . . . ab and the prefix ab is placed at the end of the sentence). Recently I caught myself accidentally making a similar sentence construction while writing in English. I was using an English phrasal verb, and I accidentally wrote the preposition at the end of the sentence (instead of right after the verb as it should be in English). The amount of interference languages make on each other in my head depends on how similar they are to each other. For example, when I started learning Italian, I was constantly influenced by French I already knew (Italian and French are quite similar, especially when it comes to grammar). I perceive German and English as similar too. Yet I hardly ever mix up, for example, English and Russian, because these languages differ from each other a lot more. Mixing up English and German? Now that’s simple. My biggest problem is, by far, the punctuation rules. I mix up those all the time. If your sentence starts with an independent clause that’s followed by a dependent clause, should you put a comma between both of them? In English you shouldn’t. If the mall is open, we will go shopping. We will go shopping if the mall is open. Of course, in my native language these rules are different—in Latvian you should put a comma between both clauses regardless of their order. Learning all the punctuation rules for only one language was simple. Back when I had to worry only about Latvian punctuation rules, my life was great. But when I tried to learn these rules for other foreign languages, it became really hard not to mix them up. He said, ‘We will go shopping if the mall is open’. Now try not mixing it up! In German I tried to get by with simply applying Latvian punctuation rules to my written German sentences. Latvian writing system was made in 1920ties by German-speaking linguists, so the rules were often similar. But English and Latvian punctuation systems are extremely different. Of course, now I’m wondering just how many punctuation mistakes I just made in this comment. It must be a lot. Random suggestion: Cut a little triangle, 1″ sides, out of the nicest bit of the mokume you ended up with. Polish it, drill one corner, put it on a chain. You will have a delightfully pretty and unusual pendant, and also a constant reminder/warning about what happened when you made it. The dental records and DNA are so your executor can quickly and conclusively identify your remains. Nomex undies notwithstanding. Ok. I think I’m all caught up. Nice shop! I’m quite jealous at the moment. I moved from a rural area with a nice big shop space and no one around to complain about noise to a suburban one story ranch. My new “shop” is my garage. Had to downsize to only the very basics, so no power hammers or presses. Working on making my hot work equipment mobile so I can roll them out into the driveway, work, then roll them back in. Not optimal but needs must. The spirits of the forge are not to be trifled with! You have the best fun! May I have the swarf? (The molten blobs). Unfortunately, I already sent the mokume on to a new home, where it is safe from me. I am planning on making pendants with the next batch, though, or seeing if I can turn it in a lathe. They appear to like Solera, as I was saved. And now, I am stuck pretending to be superstitious. Well, it was a good suggestion, anyway. Thank you. I have been using my opening prayer and libation as a moment to let go of everything else that is going on in the world and focus my attention down to a point.